Seagram’s first introduced Crown Royal in 1939 to celebrate King George VI and Queen Elizabeth visiting Canada and it remained a Canadian only product until 1964. The beverage giant Diageo acquired the Crown Royal brand in 2000 when Seagram’s was dissolved and since then there have been numerous versions and variations of the original released. Like most Canadian whiskey it’s a blend of different grain whiskeys of various ages. 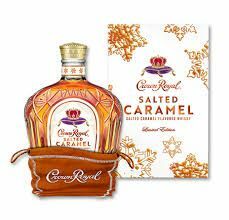 This version to come out of the Crown Royal brand is Salted Caramel. The idea behind this was to infuse a blend of Crown’s best whiskeys with the subtly salty-sweet taste of indulgent salted caramels – imparting lush, creamy notes that compliment the richness of flavors that come out of the master-blended casks. Crown Royal has a rather unique presentation. Their definitive crown-shaped bottles came from when Seagram’s introduced the Crown Royal brand to King George VI and Queen Elizabeth. Salted Caramel is no different. Like every bottle of Crown Royal, it gets treated to the signature crown-shaped bottle. This bottle though comes in a decorative display box and caramel-colored display bag with drawstrings. Like most Crown Royal variants, Crown Royal Salted Caramel has an amber, almost copper color to it. When swirled in a tumbler, it has a thick-like look and feel to it that is consistent with most flavored spirits that have added sweetness to them. The aroma that billows out of the glass presents a pleasant, light maple syrup. Mixed with the maple syrup are aromas of wood and grain from the cask as well as hints of vanilla. The initial delivery brings a flavor of maple and caramel forward with a subtle peppery spiciness from the oak and grain. The spiciness carries a light touch of black pepper and orange-peel zest. The added sweetness of the caramel gives the spirit balance and cancels out the heavy oak and grain taste that comes with non-flavored whiskeys. The mixture of flavors provides an even balance on the taste buds that will leave you pining for more.